Cleveland's historic Tudor Arms Hotel has always been a spirited place to entertain and be entertained. The perfect setting for congenial gatherings, luxurious functions, and quality time spent with loved ones, the hotel boasts a rich history full of tradition and zeal at its distinctive Carnegie Avenue address. In 1929, the hotel's original structure was completed by famed architect Frank Meade after the University Circle neighborhood was primed for expansion to make way for spaces of unparalleled luxury. Originally constructed to become the Cleveland Club, this bustling men's group welcomed elite members of society through its doors, allowing them to enjoy elegant offerings on each of the Club's 12 floors. Members could enjoy extensive recreational facilities nestled amid vintage detailing and host lavish private events in the Club's spacious ballrooms. Though the Cleveland Club was an exclusive oasis with plentiful interest, it could not weather the insurmountable Great Depression. In 1939 following the tumultuous financial period, the building was converted to a hotel by a New York inquirer and was renamed to The Tudor Arms Hotel. Remaining a place where high-society functions abounded, the hotel welcomed famous entertainers into its ornate ballroom spaces. The elegant sounds of jazz music could be heard throughout the building's halls, and opulent dinner services were offered alongside the performances. Gradually, the structure once again met its demise as the bustling and, at times, raucous outlet was soon unwanted by the community, which began putting an emphasis on University Circle's historic appeal. 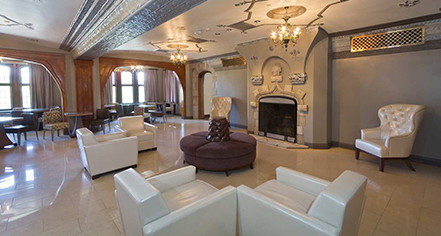 In 1960, the hotel was purchased by Case Western Reserve University to be used solely for graduate housing and the glitz and glamour of the property's original purpose gradually faded away, allowing the building to become completely desolate. In 2011, MRN Ltd. in tandem with Hilton purchased and restored the structure into The Tudor Arms Hotel, unmasking the building's bygone glory. Once again, the hotel has become a celebrated gathering place for meetings, parties, and events due to its revered ambiance, and continues to allow for one-of-a-kind memories for its guests today. 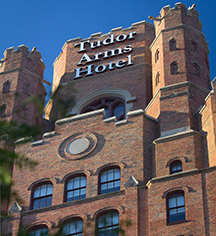 Beginning and ending as a unique gem, The Tudor Arms Hotel has continued to remain a historical presence in Cleveland's University Circle neighborhood, with a legacy that is distinctly recognized by locals and visitors alike. The Tudor Arms Hotel Cleveland, a member of Historic Hotels of America since 2015, dates back to 1929.